Multiculturalism’s project at the end of the twentieth century was to offer a complete map of American diversity and model the image of a nation that makes space for all groups. What has been missing from our cinematic map of late-twentieth-century America, however, is Indian Country. As noted in chapter 1, films that the-matized white-Indian contact in a manner ostensibly sympathetic to the Indian perspective peaked in 1969–1971. 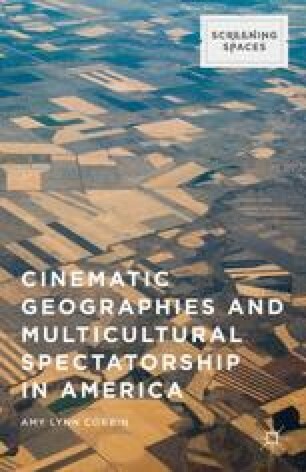 Then, the three landscapes key to depicting multiculturalism in the post-sixties era—the South, the inner city, and the suburbs—all drew on themes that can be traced to that primal American contact zone: themes of white rebels or primitives, of spaces in opposition to modernity that offered either chaos or liberation. However, direct representations of Native American cultures or Indian Country were largely absent from popular cinema.